Crop load management is one of the most important areas of orchard management that growers face each year. Because fruit trees often set more fruit than necessary, to ensure good size and fruit quality, fruit load is commonly reduced by thinning to reduce fruit-to-fruit competition, allow fruit enough room to grow, to expose fruit to adequate sunlight, and for better overall fruit quality. Reducing the crop load by thinning to a certain number of fruit is also important for next year’s crop. Fruit trees start making flower buds for the next season’s crop in the current growing season, therefore the crop load decisions that orchardists make will affect the current year’s production, as well as the next year’s crop. If a crop is not thinned properly, and too many fruit are left on the tree, the fruit will be small due to too much competition, the resources that would go towards next year’s buds being diminished, and producing too few return blooms the following year. If too many fruit are removed from the tree, the fruit will grow too large, which increases fruit quality and storage problems. This is also a problem during the “off-year” of alternate bearing fruit trees, when there are too few apples on the tree. Orchardists use a variety of methods for tree fruit crop load management. The earlier that fruit thinning is done, the better to have a positive impact for carrying a larger crop, and for a good return bloom the following year. Pruning, chemical thinning and hand thinning are primary methods that growers use to achieve the desired number of fruit per tree. Chemical blossom thinners cause damage to blossoms and reduce overall fruit set. Post bloom thinners mimic plant hormones, causing physiological responses in trees, which cause fruit to drop and reduce the crop load. Reflective fabrics laid on the orchard floor reflect sunlight back up into the tree canopy and can have positive impacts on both crop load and fruit quality. New technologies to mechanically prune, blossom thin and even pollinate are being commercially used or tested today for more efficient and feasible crop load management in fruit trees. These tools were created with future labor concerns in mind. Hand thinning blossoms and fruitlets is labor intensive and expensive but is used when other methods have not removed enough fruit or more precise thinning is still required. This may particularly be the case where fruit size is important and the cultivar has a high market value, therefore justifying the added labor cost. Precise pruning, making accurate bud and blossom cluster counts, chemical and hand thinning fruit to a desired number of fruit per tree all help to ensure the best results. Scientists at WSU and other universities are helping growers use models and decision-making tools that will enable them to make informed crop load decisions about the ideal crop loads for their specific trees, training systems, and weather conditions. Different fruit cultivars will naturally bear different sized crop loads, and this needs to be taken into consideration when making crop load management decisions. Other factors including tree stress, tree age, and temperature play a role as well. Apples, pears, and Asian pears usually require thinning. Cherries may benefit from thinning as well. For specific information on Crop Load Management click on the accordion titles below. Blossoms begin to deteriorate with age (senesce) as soon as they are open. As orchard temperatures increase, this can affect pollen germination on the stigma, pollen tube growth down the style and the viability of the ovule for fertilization. Cool temperatures can slow pollen germination and pollen tube growth rate. Warm temperatures can accelerate pollen germination and pollen tube growth rate. However, temperature extremes (too hot or too cold) can adversely affect fruit set. Fruit trees that are not “self-fruitful” require pollinizers for cross-pollination. The pollinizer is the tree source of pollen that is used for cross-pollination. Usually, these are trees of a different variety that bloom during a similar timeframe. In the case of apple, it may be a particular flowering crab apple variety (e.g., Manchurian). For self-unfruitful sweet cherry varieties, there are cross-compatibility groups identifying varieties that are suitable to interplant to ensure good fruit set. Pollinizers are not necessary for self-fruitful varieties. Refer to our Pollination page for more information. ‘Manchurian’ crab apple, as noted above, has been a widely utilized pollinizer for apples in Washington. However, because it is a host plant for speck and Sphaeropsis rots that can show up on apples in storage (or later) and it can adversely impact export market access to Asia, alternative pollinizers are being considered and research is being done to manage the disease. See the following video for more information, Managing quarantine-significant post harvest diseases in Pacific Northwest apple and pear orchards. The pollinator is the insect that carries pollen from one tree (the pollinizer) to another (the desirable fruit bearing tree) to facilitate cross-pollination. Commonly, this is the honey bee. Warm temperatures increase pollinator activity, and cool temperatures reduce pollinator activity. Care must be taken during bloom time to be sure that no pollinator toxic chemicals are applied that could kill or harm the pollinating insects. The U.S. Environmental Protection Agency has a website with helpful information, Protecting bees and other pollinators from pesticides. Fruit set can be reduced when trees are experiencing stress. This could be from excess or inadequate water or nutrients, insect or disease problems, viruses, etc. If fruit trees do not receive adequate cold during the winter, spring flowering may be delayed and extended, which may lead to weather and disease problems on blossoms. (e.g. possible frost injury or fire blight). For a recent review of pollination in apple, refer to the Growing Produce article An in-depth look at bloom. Recent cherry research by Drs. Matt Whiting (WSU) and Lynn Long (Oregon State) has demonstrated that use of ReTain can help preserve the blossom tissue (ovule) longer in sweet cherries and improve fruit set. (ReTain can improve cherry fruit set, Good Fruit Grower) Dr. Matt Whiting, WSU has conducted research on cherry germination and fruit set related to temperature and other environmental conditions. Read the Good Fruit Grower article Understanding cherry fruit set, for more information on this research. In the spring time when trees have used up their stored carbohydrate reserves and they are not yet making enough new carbohydrates through photosynthesis, it is possible that a carbohydrate deficit could adversely affect fruit set. The supply and demand of carbohydrates and temperature can impact how well apple fruits will set on the tree. According to Phil Schwallier, Michigan State University, cooler temperatures require less carbohydrate use by the tree, making it more difficult to chemically thin apples when it is cooler. However, warmer temperatures will cause trees to use more carbohydrates, making it easier to thin fruit in these conditions. It is easy to over-thin trees when the temperatures are too warm. Mr. Schwallier says that the best time to thin is during low light (cloudy days) and warm temperatures, which creates a low supply and high demand for carbohydrates. Dr. Alan Lakso, Cornell University, has developed a computer model (see Carbohydrate model for apple thinning below) that estimates apple tree photosynthesis, respiration and growth of fruits, leaves, and roots using daily maximum and minimum temperatures and irradiance from the sun to calculate daily tree carbohydrate production. This information is used to determine how many carbohydrates are used for tree organs and the carbohydrate balance in the trees. This information is helpful for growers to predict thinning spray response so that they can adjust applications accordingly. They have observed that the response of apple to chemical thinning was stronger during times of carbohydrate deficit when the day temperatures were high. Growers prune for a number of reasons, including increasing the sunlight penetration into the tree canopy. Proper dormant (and summer) pruning can improve light relations that results in better cropping and improved fruit quality. This can influence the number of flower or vegetative buds for next year as well. Further, dormant pruning can be used to achieve a specific fruit bud count (per limb or tree) to decrease the amount of fruit that will need to be thinned chemically or by hand. Blossom thinning can be done early in the growing season when blooms are around the “popcorn” stage of development and it can be a good way to reduce a heavy bloom. This is labor intensive and expensive for the producer and should be reserved for high value cultivars where the added cost can be made up on high return at sale. Chemical thinning can be done at both the bloom and post-bloom stages. This is typically done with air-blast sprayers to reduce fruit crop loads. Thinning sprays applied to apple and pear trees at bloom and post-bloom are intended to decrease the fruit set, increase fruit quality, and increase the return bloom the following year. Bloom thinners burn and injure the flowers and flower parts, and stress the plants, so fewer fruit will set. Materials like lime sulfur and fish oil when combined damage the blooms, reduce pollination, and cause fewer fruit to set. This combination has proven to be an effective bloom thinner for orchards in Central Washington, and can be used for both organic and conventional growers. Refer to Lime-sulfur/oil products in the 2015 WSU Crop Protection Guide for more detailed information. There are several opportunities for fruit to be chemically thinned based on the stage of development of the flower or fruit. These include: Bloom; petal-fall, when fruit are 7-15mm in size; and when fruit are 18-25mm in size, according to Dr. Duane Greene, the University of Massachusetts. “It is hard to thin fruit that are larger than 25 mm in size,” he says in the Good Fruit Grower article Thinning apples with more confidence. Thinning sprays vary in their ability to thin fruit to the desired number of fruit remaining on the tree. Different apple varieties will react to chemical thinners differently. Sprays are taken up by trees differently, depending on the rate of chemical applied, the temperature and humidity when it was applied, the method used to apply the chemical, and the stress of the tree. Chemical thinners also vary in how well they will work depending on how many blooms or fruit are on the tree when they are sprayed, the size of leaves, the tree’s carbohydrate supply, and the temperature during and after spraying. Post-bloom thinners that are applied after the petals fall usually mimic plant hormones, causing physiological responses that cause the fruit to abscise, thus reducing the crop load. For detailed and specific information for apples, pears and other stone fruits, please see the Bioregulator Sprays section and subsections (e.g., apple chemical thinning) in the 2015 WSU Crop Protection Guide. Post-bloom thinners are used when the bloom thinners did not remove enough fruit. Benzyladenine (BA) products are effective post-bloom thinners, especially with a few warm days with temperatures around (60° to 70°F), according to Tory Schmidt, Washington Tree Fruit Research Commission in the Good Fruit Grower article Tools growers should be using. Varieties that are more likely to exhibit alternate bearing benefit with plant growth regulator applications that stimulate flower formation for the following year. Bio-regulators can encourage different responses in fruit trees, depending on when they are applied: just after petal fall, during the growing season, or near harvest to prevent fruit drop. This can be both labor intensive and an expensive practice for growers. The goal is to use pruning and chemical thinning first, to achieve most of the fruit thinning, then hand thin the remaining few fruit per tree to reach the target fruit number. Less hand thinning is required after chemical thinning, and the remaining fruit will have improved size and quality. Hand pruning is labor intensive and expensive for growers. Concerns about both the cost and the future availability of labor have been an incentive for research on mechanical pruning. Tall, narrow tree shapes and tree wall canopies are better suited for mechanical pruning and research programs in the U.S. and Europe are investigating techniques and machines to speed up the process. At WSU Center for Precision and Automated Agricultural Systems (WSU-CPAAS), scientists are conducting research on mechanical pruning of apple and cherry trees. For their project description, refer to 3D reconstruction of trees and bushes for mechanical pruning. 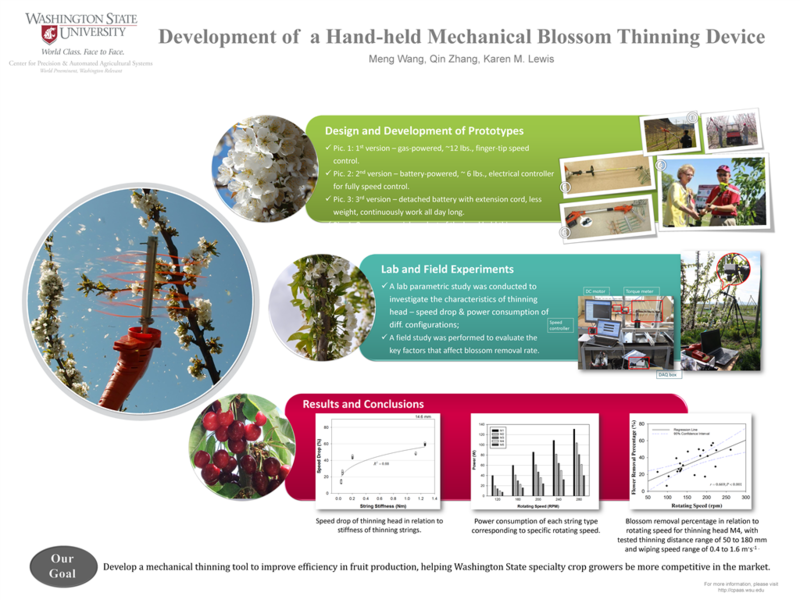 Hand held and tractor-mounted string thinners, effective for apple and cherry crop load management are currently being tested by WSU-CPAAS scientists and used commercially for bloom thinning. This technology is particularly relevant for organic producers that have access to fewer products for chemical thinning than do conventional growers. For the project description, refer to Innovative Technologies for thinning fruit. Dr. Matt Whiting, WSU, is conducting research on Mechanical pollination of apple and cherry orchards. Read the Good Fruit Grower article Precision pollination, for more information on this research. Use of Extenday and Mylar can help growers receive better returns according to T. Schmidt, Washington Tree Fruit Research Commission. In their research, they noted that reflective materials increased fruit set, yields and fruit weight and resulted in improved coloration and a higher proportion of WA Extra Fancy grade fruit. For more information, read the Good Fruit Grower article Tools growers should be using. The young apple thinning gauge, developed by Dr. Terence Robinson, Cornell, is used to balance crop loads with vegetative growth. The tool looks similar to a ruler, and when held up against young tree trunks, will measure the diameter and give a number of fruit per trunk cross sectional area, so growers know how many fruit to leave on trees. For more information on the young apple thinning gauge, and the other thinning tools listed below, see the Growing Produce article Take the Stress out of Thinning Apple Trees. This plastic, notched disc tool, developed by the National Institute for Agriculture Research in France, is placed on branches, and based on the size of the branch, will give a target number of fruit for that branch, to guide workers when thinning. This may be a good guide tool for high-density plantings. For more information on Research conducted by Dr. Jim Schupp using the Equilifruit disc for tall spindle apple trees, please refer to the Pennsylvania State extension webpage. The Pollen Tube Growth Model, developed at Virginia Tech, with funding by the Washington Tree Fruit Research Commission, is a temperature based apple variety-specific model that will calculate how long it will take to fertilize a blossom after pollination. The Good Fruit Grower article Take the guesswork out of thinning describes the Pollen tube growth model. The pollen tube growth model is a chemical thinning decision aid. Pollen tube growth varies depending on apple varieties and the temperature. Growers need to know what their per-tree target yield will be to start. As soon as trees begin to bloom, growers measure flower styles to calculate average style lengths. The model will calculate crop load targets and then the grower counts open flowers on 5-10 rep. trees, and when enough blooms are open to achieve the target yield, the model should be started. It predicts pollen tube growth (% of average style length) based on weather data. Tree spacing, is part of the calculation. This tool helps growers apply thinning sprays accordingly. After the thinning spray is applied, the model resets to 0, so that future thinning applications can be made at the right time. Spray when pollen tubes are no more than 75% of the average style length. The model was developed using data from Washington collected by the Washington Tree Fruit Research Commission for WA growers. The model is available at WSU’s AgWeatherNet website, where users need to set up a free AgWeatherNet account to access the pollen tube growth model. There is a YouTube video explaining how to create an AgWeatherNet account and set up the Pollen tube growth model for your first block. For more information, please refer to the pdf presentation How to use the pollen tube growth model. Click on the accordion titles below for additional resource links organized by crop. Implementation and evaluation of apple pollen tube growth models, 2015. Management of vegetative growth in apple trees with bioregulators, 2012. Crop load and canopy management of apple, 2011. Mechanized thinning for labor efficient tree fruit crop load management, 2011. Chemical thinning, Crop Protection Guide for Tree Fruits in WA, EB0419, 2016. Bioregulator sprays, Crop Protection Guide for Tree Fruits in WA, EB0419, 2016. Pollination of fruit trees, WSU, Spokane County Extension, factsheet #C105, (pdf download), 2005. How to use the pollen tube growth model, J. McFerson, K. Larson, H. Schell, and A. Zediker, pdf, 2014. Making money through tree canopy management: Crop load, fruit size, return bloom & fruit finish, T. Schmidt, WSHA Annual Mtg., 2011. Precision crop load management, T. Robinson, Cornell University, Good Fruit Grower, May, 2015. Apple fruit thinning, eXtension, T. Robinson, Cornell University, webpage, 2013. (Accessed 1/19/17). A model for apple thinning, R. Lehnert, Good Fruit Grower, (Carbohydrate model-Alan Lakso, Cornell), March, 2015. Take the guesswork out of thinning, G. Warner, Good Fruit Grower, (pollen tube growth model, Virgina Tech., AgWeatherNet), March, 2015. Precision pollination, M. Hansen, Good Fruit Grower, March, 2015. Stress-free thinning, P. Schwallier and A. Irish Brown, Good Fruit Grower, March, 2015. Use precision cropload management tools to target apple crop load, P. Schwallier and A. Irish-Brown, MSU, Fruit Growers News, April, 2015. An in-depth look at bloom, J. Schupp and T. Kon, Growing Produce, March, 2015. A strategy for precision crop load management in apples, B. Sparks, Growing Produce, January, 2014. Take the stress out of thinning apple trees, R. Jones, Growing Produce, (lists tools and models for thinning), May, 2014. Thinning apples with more confidence, R. Lehnert, Good Fruit Grower, May, 2014. Adjust Honeycrisp crop early, G. Warner, Good Fruit Grower, January, 2014. Protecting your high-value crop, M. Hansen, Good Fruit Grower, March, 2014. Protecting your investment, D. Layne, American/Western Fruit Grower, Sept./Oct., 2013. Thin ,Thin, Thin! R. Lehnert, Good Fruit Grower, April, 2013. Precision crop load management, T. Robinson, et al., New York Fruit Quarterly, 21(2), Summer, 2013. Tools growers should be using, M. Hansen, Good Fruit Grower, March, 2012. Crop load management and the market profitability of ‘Honeycrisp’ apples, R. K. Gallardo, et al., HortTechnology, 25(4), August, 2015. Thinning tall spindle apple based on estimations made with a hand-thinning gauge, T. Kon and J. Schupp, HortTechnology, 23(6), December, 2013. Development of a fruitlet growth model to predict thinner response on apples, D. Greene, et al., HortScience 48: 584-587, May, 2013. Successful blossom thinning and crop load regulation for organic apple growing with potassium-bi-carbonate (Armicarb®): Results of field experiments over 3 years with 11 cultivars, F.P. Weibel, et al., Europ. J. Hort. Sci., 77(4), p.145-153, 2012. Alternate bearing in fruit crops, Pennsylvania State Extension webpage. (Accessed: 1/19/17). Chemical thinning of apples, Pennsylvania State Extension webpage. (Accessed: 1/19/17). ABA Chemical fruit thinning of Bartlett pears, 2015. Improving fruit set, production efficiency, and profitability of pears, 2015. Pear crop load management and rootstock field-testing, 2012. Pear chemical thinning, WSU Crop Protection Guide Online, 2016. Promotion and management of pear fruiting, T. Einhorn, et al., OSU, Good Fruit Grower, March, 2013. Influence of Abscisic acid and Benzyladenine on fruit set and fruit quality of ‘Bartlett’ pears, D. Greene, HortScience, 47(11):1607-1611, 2012. Early season estimation of fruit set and size potential, 2015. Influence of cropload level on fruit size and quality of sweet cherry, 2013. Improving sweet cherry yield security and fruit quality, 2012. Cherry Training Systems, L. E. Long, et al., PNW 667, 2015. Four simple steps to pruning cherry trees on Gisela and other productive rootstocks, L. Long, PNW 592, 2007. Understanding cherry fruit set, M. Hansen, Good Fruit Grower, March, 2011. Crop load and time of thinning interact to affect fruit quality in sweet cherry, S. Bound, et al., Journal of Ag. Science, 5(8), 2013. Crop load management does not consistently improve crop value of ‘Sweetheart’/’Mazzard’ Sweet cherry trees, T. Einhorn, et al., HortTechnology 21(5), 2011. Programs to increase yields of target fruit in peach and nectarine, 2011. Mechanized thinning for labor efficient tree fruit cropload management, 2011. Performance of mechanical thinners for bloom or green fruit thinning in peaches, S. Miller, et al., HortScience, 46(1):43-51, 2011.